Its Tuesday, I'm bored. The kids are at the grandparents and my wife is at s musical practice. I have eaten meat! And now I've realised that at a push I've had 2 of my 5 plus a day, cos supermarket sushi doesn't really count as a vegetable (even if you get the amazing vegetable spring roll sushi, or the delectable chicken cranberry sushi, direct from top ethnic fusion outlet New World Supermarket Pahiatua). 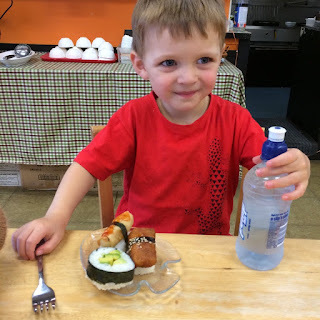 On a tangent, I had briefly considered turning this blog into some sort of crap sushi or crap ethnic food blog, but my attempts at including family were thwarted by the three year old, who when on being exposed to Japanese food for the first time, declared loudly to the whole (actual authentic and quite nice this time) sushi bar, that he would 'not eat here EVER AGAIN', on account of it not warming him up on a cool day. Anyway, in an attempt to reach my required vitamin C intake for the day I'm currently cramming as much fruit as I can into my pie hole at 10pm. Do hops count in your 5+? I'm saying yes, anyway. And it's persimmon season! Isn't that great! But I feel I need an accompaniment for my fruity delights, and there's no ice cream. 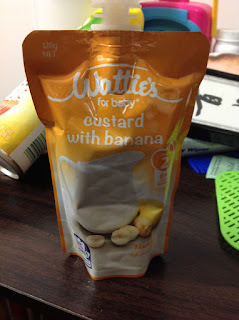 Raiding the cupboard, my eye falls on a small sachet of Wattie's baby custard. Surely Emily won't mind if I nick it? It's not like she'll be eating it? The ingredients look far removed from my previous baby food experiences. Not just simple mushed vegetable with some starchy carbohydrate: this has full cream milk (25%), sugar, butter, and cream, to be avoided for the body conscious six month plus year old looking to fit into that perfect onesie for summer, but a great winter comfort. It looks like gelatinous gloop. And it's the colour of curdy baby vomit. Which, when you're a six month old, is something you might try and eat back up again. 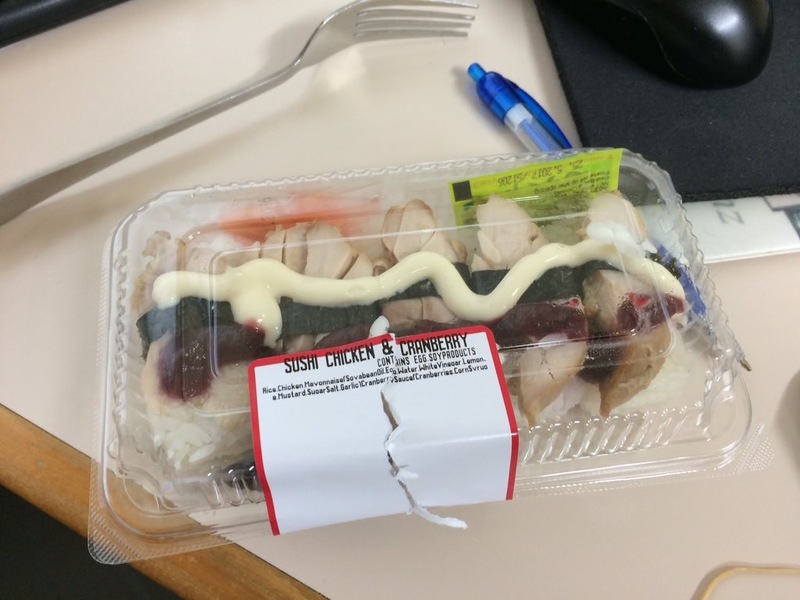 When you're thirty two, it's not as appetising, but maybe that's my problem. And anyway, I'm desperate for some accompaniment for my fruit, so it will do. The smell is bananaey enough, maybe not that authentic, real fresh banana, but the fake banana smell reminiscent of the time you made esthers in sixth form chemistry if you were a hard out nerd like I am. The taste, unfortunately is a massive let down. First and foremost it's just a slimey texture, but then there's that horrible artificial banana dairy-food taste coming through and ruining anything. What is weird to me, is the smoothness. I can't believe I'm saying this after all these reviews, but it needs some bloody quinoa in there, something to give it grit, chia seeds, anything. 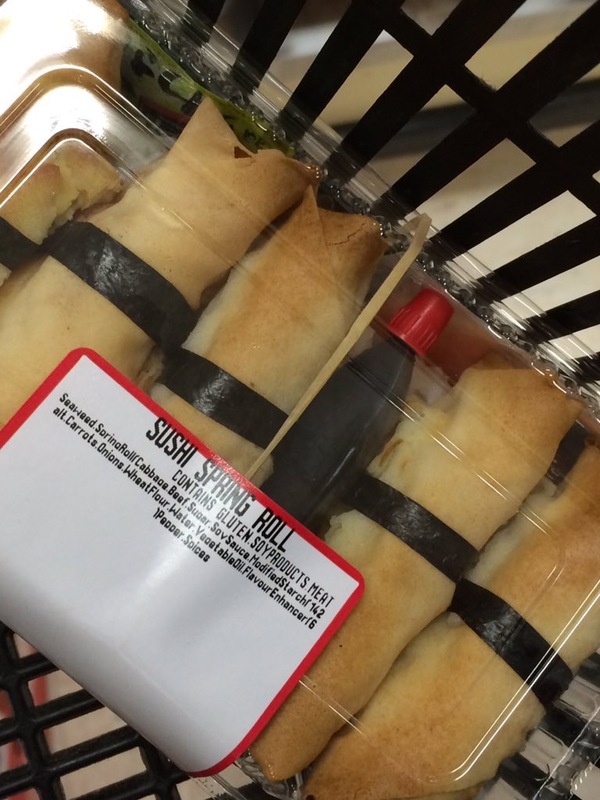 Does it work as a condiment or a dip? Not really. 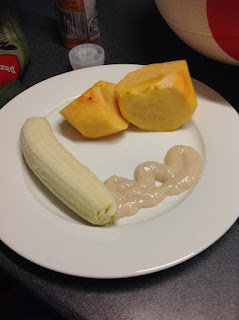 I dipped my banana in (ooh er missus), but the sauce just slides off, that's not a custard, custard needs to adhere, to be able to smother the accompanied food item and decimate any other taste that may be present. The persimmon faired even worse, I don't know why I even bothered trying to dip. Frankly, this custard is a disappointment, Mr Wattie. I've seen better served up as airline food.